This week, I’m sharing some of the cool little ways we’re spreading our message for free … or at super low costs. Here’s kind of a fun one. You’ve probably seen versions of this on Facebook with various other causes. Basically, you try to find a message that people want to be associated with and give them an easy way to attach it to their profile picture in their Facebook feeds. Our graphic artist Richard Aguirre designed this, and the arrow points straight to the picture of the person who shares the image. Kinda cool huh? 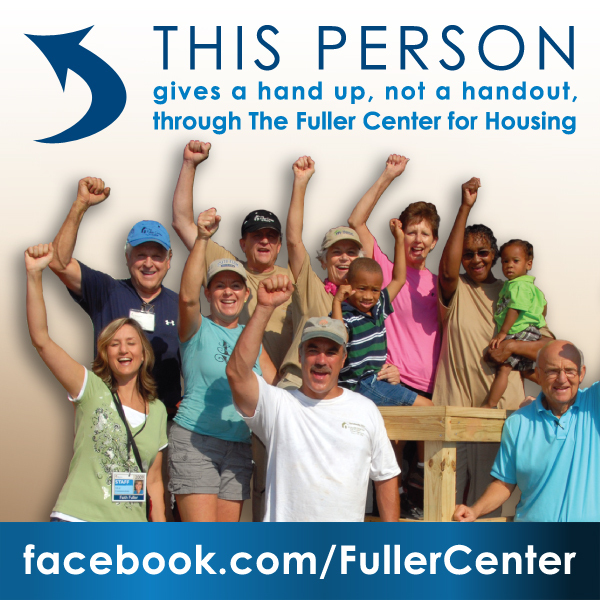 If people like the photo and the message (and, again, nobody seems to be against helping people help themselves as we do at The Fuller Center for Housing), then they are likely to click “share” on such a photo and it appears next to their picture. And if their friends like it, they might share it … and so on and so forth. The point is that the more it’s shared, the more people get a glimpse of what we do here. It’s more likely to get shared than a long story … which kind of stinks for writers like me who love to tell a story with words more than with graphics, pictures and video. Oh well, it’s the short-attention-span world we live in and my immense literary genius is just going to waste! There’s one example at the top right and a simple explanation of how it works below. Be sure to go to our Facebook page and pick out one of these images you like best. I personally like the cute little girl below from Peru (who lives in a Fuller Center home, and you can see a video of her by clicking here), but some folks might like the one above that shows more folks in action. It’s your choice. 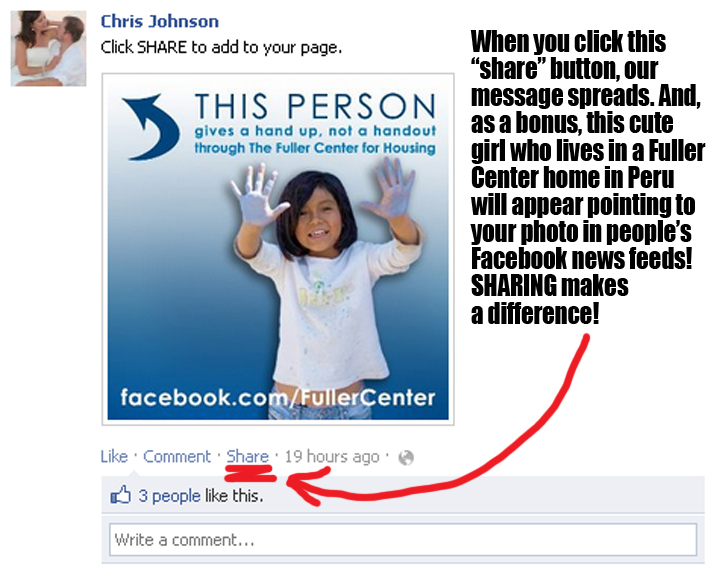 All I ask is that if you agree with the message, just take the fleeting moment it requires to click share. That fleeting moment of your time could change somebody’s life! And, oh by the way, if you’re wondering who the cute girl is, her name is Zuinmy. And if you’re wondering who’s the cute girl in the profile picture to which this is pointing, that’s my wife. So, as you can see, the next image I post like this probably will point to my photo and say "This person is one lucky dude!"